Ideal to hold your bird table firmly into position. Simply push firmly into the ground. 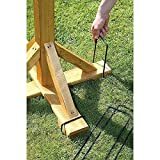 The Bird Table Stabilizers from Tom Chambers are stabilising pegs, ideal for bird tables which are vulnerable in windy conditions, or in danger of falling on children or pets. The stabiliser pegs are easy to use, simply push them into the ground – one over each foot of your bird table. The Hutch Company - Garden Bird Table - 46"
This entry was posted in Birds and tagged Bird, Stabilisers, TABLE. by One Boutique. Bookmark the permalink.